3DPrintWise news presents many of the latest machines being marketed for consumer and small business use. It is a crowded market with new 3D printers being launched worldwide every week; not just for professional business use but consumers too. In some ways, the market dynamics are very reminiscent of the early days of home computing where there were many vendors vying for position. Zortrax As A Plug & Play Device. What Does It Mean? Do You Own A Company? What Kind Of 3D Printer Should You Invest In? 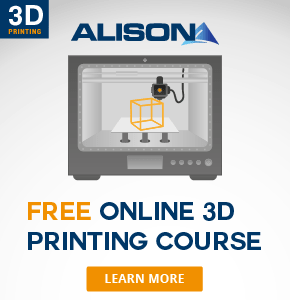 Alison, a provider of free online learning and studies has just launched a free online course for 3D printing and how to use a 3D printer. Supporting your buying decisions, Aniwaa is a new system offering customers a great way to compare 3D printers, scanners and supplies of filament.